[Sacrifice] is a cornerstone of Michael Burnham, this complete devotion to duty and to principle and to sacrifice. And you do see that from Michael Burnham from the very beginning…It speaks to this complete need to almost rewrite history. I have made a lot of mistakes as Michael. I have certainly cost a lot of lives, all with great intentions. I grew up on Vulcan knowing the needs of the many outweighed the needs of the few, but then as a human, I care about the few and the one. So, it is the constant balance and this constant fight to save everyone and sort of right all these wrongs from the past and be absolved and also do what I need to know needs to be done because I have given my life to this service. So much of who I am – so much of my identity is rooted in shame and guilt. Because that started from the very beginning. I always felt I was responsible for my parent’s death…And I was responsible for those Vulcan kids and teachers being killed when the Vulcan Learning Center was bombed by the Logic Extremists. I was pseudo-responsible for Georgiou. There are so many things I have been responsible for—obviously, the Klingon War. And so, to hear that the thing that started it all—the inciting incident that began my entire journey of guilt—did not happen that way. It wasn’t because of me. It was because of what they were doing under the behest of Leland. It’s basically: the world you know isn’t the world you know…If that had not happened, I would have never been on Vulcan. I would have been able to live a normal life on Earth. I would not have had to assimilate to this other culture, which I appreciate the Vulcan upbringing, but it was very difficult. But the whole trajectory of my life would have been different if they had not been taken from me. Him finally forgiving me because that is yet another thing I was carrying shame for, even though I was doing it to save his life. I thought it what was best. I was eleven. Still, I know that it broke him and the way that he came at me so furiously when we first reunited. It was two huge points of guilt I got to let go…I love that that the beginning of us coming back together is forgiveness. There is almost a Romeo and Juliet aspect to it. There are always circumstantial issues. There are always things that are pulling them apart. They are almost magnetized where they want to come together, but too many things keep separating them…I don’t know what the kiss is. I think it is many things. I think it is ambiguous. I think it is relief. I think it is the fact that they can’t stay away from each other. They understand that the situation is not really the best ground for them to build on, but they can’t help but love each other. And they can’t fight it, even though all these things are keeping them apart, they keep coming back together. We are just going to see what happens with that. What does that mean? Are they going to be able to say goodbye, because it’s what’s best for them? Or are they going to get closer, because it’s what’s best for them? It is very, very complicated. And there isn’t an answer. And that is the truth about love. We understand that we are not the other’s counterpart. I am not the daughter you raised in the Mirror Universe. You are not my captain that became my mother in a lot of ways. But we can’t help but love each other…The big problem is there is no trust there. That is what makes our relationship so crackly, so spicy. It is so tentative because we love and respect each other, even though that makes no sense. We don’t actually know each other – Mirror and Prime…So, I love that when we embark on this huge mission that is obviously going to be very sacrificial on my part, because we have to capture this Red Angel. We think it’s me. And she loves me. I love how she respondes in that moment when I am suffocating, when I am dying and she thinks I want out and she just can’t take it anymore. I love the maternal instincts that just come out. He is one of our favorite directors because he brings with him the context of Trek. So, when we are in a space with his presence we go “wow, we are doing Star Trek!” He welcomed us from the very beginning. He sort of shepherds us in such a beautiful paternal, almost brotherly kind of way. We can really trust him. He is a comforting place for us to land on. He’s an actor’s director as well. So, all of his choices – you have this unspoken understanding between you, and you speak the same language. It is such a free space to work in with him. We are thinking at this point that the Red Angel is me, so that is a huge reveal. Coming right off the tail that Leland was responsible for it, so I don’t know what reality is. I have also just sort of died for a moment. So, is it fantasy? Is it a vision? Or is it real? We don’t know at this point. When we are at near-death experiences you see things. You see visions of people that have passed. You kind of daydream and leave your body in that way. So, is it one of those out of body visions or is it real? We can’t trust it. Actor Doug Jones revealed that he actually sang the Kelpien funeral song at Airiam’s memorial. Visual effects artist Timothy Peel took to Twitter to discuss how he tried to reveal how much of Airiam was organic compared to cybernetic. Speaking of that scene, Airiam actress Hannah Cheesman pointed out that the medical tech who wiped Airiam’s memories was played makeup designer James MacKinnon. “The Red Angel” featured Admiral Cornwell (Jayne Brook) flexing her training in therapy by counseling Dr. Culber. This got the notice of the actress behind Star Trek’s most famous counselor, Deanna Troi. Marina Sirtis took to Twitter to offer up her services to Brook. The Red Angel is the best thing Star Trek Discovery has ever done. Season 3 needs something spectacular like a Red Angel. This is going to trigger a lot of people, I can feel it…. XD. I have noticed that all you do is criticize Discovery and the character of Michael Burnham in particular. You never seem to miss an opportunity to shut up. Sonequa Martin Green is an amazing actor, one of the best ever to appear on Star Trek, and the same goes for Michelle Yeoh. They are both WOC, which is obviously why you have a problem with them. You need to acknowledge your privilege and ask yourself why you have a problem with these talented actors. Obviously you have a problem with diversity and inclusiveness, because you never have a problem with white MALE characters or actors. And I am calling you out on it. I agree. I love Martin-Green as an actor. She was great on TWD and I was very happy that she would be the star of the new Trek series. Michelle Yeoh has been a favourite of mine since Crouching Tiger, Hidden Dragon. And she blew it away in Crazy Rich Asians. I think it is great to have Trek continue with the diversity that it had started with in the 60s in terms of people of ethnic backgrounds and then DS9 with the first starring black Captain and with Janeway as the first starring woman in command. Trek has changed with the times and I love the equality of everything. YES. I was in middle school when Voyager premiered and even now I remember all the sexist crap (“femme Trek”) hurled at Kate Mulgrew. There definitely was. It’s a shame that we cannot look at people and not see them equally. Although the first female and black Captain was Madge Sinclair in Voyage Home. Even though she was only on screen for a short time, it was a breakthrough when it came out. I think Kate Mulgrew has developed the respect she deserves in that role now. Who exactly are you calling out? I can’t see any criticism of Sonequa Martin Green in the thread you are commenting on? I was referring to this “Professor Spock” who criticizes Sonequa Martin Green in nearly every article. Ah okay, I just couldn’t tell because of how it was displaying replies on my screen. I’m not going to comment on individual posters but for the record you can put me in the camp that’s delighted that Star Trek is finally starting to practice what it preaches in terms of diversity and equal opportunities. Is she really a great actor? I don’t think so. Now I haven’t seen TWD or anything other that she’s done, but on Discovery, she seems to only have one facial expression – and that is this whiney, look-I’m-so-sorry-and-guilty-of-everything kind of look, which annoys me big time. Yes, she’s able to deliver dialog, and comes across as an intelligent human being when interviewed, but a great actress? She’s yet to convince me of that! You need to rewatch Far Beyond the Stars, which is hands down the best Star Trek ever made. You are exactly like the people who tried to marginalise Benny because he was a POC. Except it is not 1950 any more, and as womyn, we WILL NOT be marginalised. Uhm, Feminist Trek Fan you are very much not the only feminist on this board. And I’d like to say, with delicacy, that criticism of Discovery or even SMG is not always code for sexism, or lack of tolerance for diversity. Yep, there are a few of those voices that pop up here, but many more voices that call out that behaviour. Most of us are Trek fans precisely because we are drawn to the promise of a diverse, tolerant and inclusive positive society that Trek portrays when it’s at its best. Going back through Trek series we’ve seen a progression in women’s roles, roles of people with colour, diversity in gender expression and sexual orientation. So, we should be able to critique when a series isn’t coming together as well as it should. For my part, I like Burnham but firmly believe the recurrent turnover in showrunners and writers have done the character and the show an enormous disservice. She’s a challenging and complex character by design, but the changing vision of the writers have made for incoherence. I also am concerned that a character that is a woman of colour should not need to be ‘suped-up’ with genius intelligence, plus a Vulcan upbringing, plus a relationship with a fan favourite character etc. and have the whole multi-season story arc revolve around her in order to be viable. As I noted before, many Trek fans of colour raised concerns in during TNG that people of colour had to be ‘special’ or ‘alien’ to be central characters in Trek. I would have been delighted to have a female person of colour lead a Trek ensemble who was from a fairly ordinary background as Janeway was. I think you raise an interesting point about POC characters being portrayed too often as exceptional instead of ordinary. Personally, I suspect it is more a product of trying to shift the focus of the series to be someone other than the Captain. In trying to justify focusing on Burnham, they have “suped up” her character and made everything revolve around her. Perhaps they should have tried more of an ensemble approach, but I do give Fuller credit for wanting to try something a little different. It’s had it’s pluses and minuses in my opinion. That’s not a problem for me. I’m not in the demographic for science fiction anymore. I’m not young, I’m not particularly liberal or leftist, and in fact, I’m probably going to retire soon. I’m not a Millennial looking to shove the world forward toward some kind of colorblind utopia. Nothing Trek can do, can do that. I also question the premise that the writers are souping up Burnham’s role. I do think it’s possible that they see that the future is not going to be all-white, etc. It’s not. But Burnham is who she is. Let’s assume, however, arguendo, that the writers have consciously decided to augment Burnham’s role because no female person of color has ever led a Star Trek show. What’s the fault in this? We are in 2019, not 1966, and even in 1966, Gene Roddenberry had the idea for a series that resulted in one of the most progressive national presentations of fiction of all time. Let’s say that the writers really did want to up the presentation of Burnham’s role. But don’t you see, they also raised the role of Spock, and Stamets, and Tilly … they did this even tho’ none of them were “canonically” presented. It’s part of the role of a writer, I think, to raise questions and present scenarios that don’t seem conventional. From someone who used to dabble in journalism, I’m not uncomfortable with any of this. For me, it’s about relatability. Burnham’s issues are rooted in family, which is fine. But her family is no ordinary family. They’re “souped up.” On one side we have the most iconic family in Star Trek, on the other side we have parents who are now connected to the most infamous secret organization in Star Trek. Whereas, Janeway’s fiance was an ordinary guy named Mark who has a dog. And Picard’s brother was a grumpy old man with a vineyard. And Sisko’s dad wasn’t an admiral (though he resembled one), he ran a restaurant. It’s fine with me if they want the lead character “souped up” a little, but do her familial connections have to be too? Even her relationship with Tyler is extraordinary. He’s not just some other person on the ship, ala Keiko, he’s a dastardly Human-Klingon experiment who works for Section 31! Looks like they went back to the old Hearn Generating Station in Toronto for the on planet location. It was used previously for the Hiawatha wreck in episode 1. Here’s video footage of the site. It’s an enormous interior industrial space which the city has sold off. Should have looked it up instead of relying on memory. My father worked most of his career for Ontario Hydro at the Hearn Generating Station. I still live about 3 miles from it’s location. Some of it seemed rather Gardiner Expressway-ish, what with the fraying concrete pillars and such. I didn’t like the look at all. On the plus side, the old OPG station is a stone’s throw away from the studio, which would have saved on costs. Doesn’t surprise me that she got cryptic when discussing the Red Angel reveal as I’m still thinking this is a misdirect and that it’s still her. As I said in the review thread I think it will turn out that Burnham rescued her mother before she died in the Klingon attack and then knowing that the plan was to capture her either sent her mother back to save her past self or came back and resuscitated herself before depositing her mum into the present and escaping. The plan to capture the Red Angel was based on the technology that was developed by Burnham’s parents however, we’ve seen strong evidence to suggest that the Red Angel has travelled further into the future (presumably to the evolved Discovery) and upgraded the suit so it’s plausible that future Burnham would have been able to escape. However, Burnham still needs to get her hands on a Red Angel suit and that’s why I believe it was necessary to rescue her mum and hand her over to the Discovery crew – to build the suit that present Burnham needs in order to become the Red Angel. I’m very glad SMG is keeping the suspense going. The more I look back on the final minute, the more I think that both Burnham and her mother are the red angel. It’s not clear what happened in the end. Was her mother in the suit or was there someone else in the suit who brought her? Was there a stutter in continuity? That’s the bit that confused me because the suit appeared to blink out and then Burnham’s mother stumbles forward not in it. I took that to indicate that Burnham simply transported her mother there and then travelled back to the future. We know that it’s possible to be brought through the wormhole without a suit as we saw that on New Eden. However, when looking at the teaser for next week and some of the stills you can see the suit in the background so I could be wrong on that part. Prior to last weeks episode I’d speculated that there were multiple Red Angels with different crew members travelling back in time to do what needed to be done at each of the Red Bursts. I think that scenario seems less likely now but it’s still not out of the question as Burnham’s mum may have been rescued to build them multiple suits. I figure that the Calypso short must fit into the story at some point and that’s why I think they will travel to Discovery in the 33rd century and upgrade the suit. If we consider some of the things the Red Angel has done like on Kaminar and that healing ray that was used to resuscitate Burnham we have to conclude that far future technology has been used to enhance the original design. Edit: Another thing that makes me think it’s a red herring is Burnham’s DNA. There’s no way that Starfleet would not be able to tell the difference between a mother and daughters dna – I mean even the ancestry.com dna test could work that out! Therefore she must be either the Red Angel or one of a number of Red Angels. Airiam’s comments about it all being about Michael probably indicate the former. Corinthian7 I’m glad you raised the issue in the discussion of the S2E10 review. Don’t know if many saw it but I added an observation at the bottom there that the chair in the trailer for E11 is not the same one Burnham was strapped into in E10. The new one is cushy and not bare metal, and seems to be physically closer to the projector dishes. I believe we are seeing pieces of a time loop. Also, it’s unclear what period those Klingons were from. The ship is pre 23rd century war, but the Klingon armour is from a later post was, perhaps 24th century period. It could be a new uniform L’rell has imposed. Or the Klingons could be from the future. As we know, the Klingons had time travel tech 25 years after Voyager’s return to Earth – – future Janeway used it to come forward in time in the finale. @TG47 no I hadn’t noticed the chair. Those are interesting observations about the Klingons. If the time loop does go as far as the 33rd century we could see events play out over centuries. On the other hand that pre-war Klingon ship you pointed out might mean we are going to see the attack that ‘killed’ Burnham’s parents. I have to admit, I really have no idea how the Klingons are going to fit into this yet. Yeah, well, after almost two seasons I’d say it’s safe to assume that feature is built into the show’s DNA and is not likely to change. I personally don’t mind it so much because I find SMG so impressive as a performer. YMMV, of course, but endless carping about it probably won’t make a difference. Sonequa is such a fantastic actress and she really turns it out in every performance. I really like that the last few episodes have really explained why Burnham feels the need to involve herself so deeply in everything. Sarek gave the advice that Michael followed. He actually played a hand in the Klingon-Federation War. Michael Burnham is the weakest ST character thus far. I don’t know if it’s the writing or Martin-Green’s acting, but it is uninteresting at best. She’s a decent actress. It’s the writing, imo. She was very good on The Walking Dead. I’m so sick and tired of the Burnham character, I want to either vomit or go into a coma. Well, the show was meant to be focused on her. That was the whole premise of it right from the start. Feel free to go into a coma. Weakest Star Trek character ever? Even if you don’t like her much, you can’t possibly think that she’s worse than the likes of Wesley and Neelix. Or Hoshi and Travis who were essentially potted plants on the bridge of the NX-01 for four seasons. And there is no way she is anywhere near as awful as Neelix and Kes. Sonequa is an engaging lead and there is nothing wrong with the writing. Agree to disagree…she’s an outstanding talented actress, infusing Michael with charm, gravitas, and fun, and the show’s writing is top-notch at times and always fascinating, partially character-driven, partially plot-driven, exploring a variety of themes. Discovery rocks! Yeah, I love her, I enjoy the show every week, and burnham’s one of my all time favorite characters. I think Discovery is a solid show. To true. I tend to do other things when she is onscreen (no pun intended) or can be heard. She has such a bland vocal tone. She (if you noticed her in The Walking Dead) was okay. But suited that series NOT Star Trek, which is suppose to be optimistic about a future telling stories of today’s society (although it is USA biased). I think that the Evil Future AI planted the info in Ariam’s head for them to find, so they would capture the Red Angel for it. What happened with Lelend near the end? AI using Borg tech to assimilate him to keep the plan rolling. Because we are so very nearly at the end of purging the guilt from Burnham, we are on the verge of a whole new beginning for her as a person….emotionally and intellectually free in a way she has never been. So far the show has about her redemption arc, but slowly, we are seeing, as she should see, that she has nothing serious to be guilty for. Brothers and sisters inevitably hurt each other…its only fatal if you allow it to be. Michael Burnham’s “mutiny” was a stupid move done for the right reason; if Sarek hadn’t been so concerned with his own position, he might have even stepped up and admitted to advising Michael in the first place. The war with the Klingons was an inevitability…if she hadn’t provided the Flashpoint, it would have happened elsewhere and elsewhen…one might argue that if she had not acted, the Klingons would have gutted the Shenzou anyway. I do think a season or two down the line, Saru will be sitting in the big chair, but ultimately, he will fail as a captain. He is showing signs of difficulty in reigning in his new self…I believe his confidence will stray into wreckessness. Does anyone remember what a hell of a time Spock had in command in TOS episodes like The Galileo Seven, The Tholian Web, and The Paradise Syndrome? He was, at that time, less than comfortable in command. I think Saru will come to the realization that his first best destiny is to be the sort of strong right arm that Spock and Riker were. I do think the final fate of Burnham and the Discovery will tied together, with her in command at the moment she sacrifices herself and the ship, likely with Tyler, Stamets and the fearless Saru on duty, taking down all the gripes of the continuity Nazis about the spore drive, Spock’s sister, the Crossfield Class’s advanced ship design, and all. There is something here. Something hidden in plain sight. Something getting heavy play now that may also keep everyone in play but out of view. The Discovery will be reported as lost with all hands so it can begin its new mission as a covert ship fkrba kinder gentler Section 31 as ushered in under the leadership of Tyler, Georgeou, and Michael Burnham, possibly in a handoff, possibly in a season of the sort of light crossover continuity we saw between TNG’s last seasons and DS9’s first. That may be a stretch, and it will be close to six years before we find out, but I am calling it, here and now. I have a feeling Saru might actually turn evil in a season or two. Maybe he does something irredeemable with his newfound confidence and it costs him everything. Imagine if he is the cause of Pike’s accident that cripples him? (I know that is still many years down the line, but when time travel is involved you never know). Saru has that certain vibe about him, that he is concealing something of his own motivations. The entire premise of “An Obol for Charon” turns the story of Saru on its head. The writers can have a field day with determining the whole good and bad thing with reference to Saru’s homeworld, and to be honest, the complications of this are completely unexplored. All kudos to the folks who created a link to the Prime Universe by writing in Pike and Spock. I liked the first season of Discovery a LOT, but I think, down the line, people will. single out Mount’s performance as Captain Christopher Pike as the warm welcome so many frightened, hurt fans needed to be OK with a Trek prequel series behind a pay wall. If you are not watching this yet, you are missing out. The first season is on sale as a download and in physical form…I’d sure as hell buy this before I’d buy a DVD of Solo: A Star Wars Story, Batman v Superman, Alien: Covenant, Season One of Krypton, or any of the other cannibalistic crap that provides nothing more than fanservice. I agree, though, that if you’re not watching DISCO, you are missing out. @Chuck Abernathy Pike is one of the most realistic commanders I’ve seen portrayed in Star Trek. Mount does a great job of understanding the character. You can see this in the actor’s mannerisms while in character; you can see the validity of writers’ concept of Pike. Pike takes no orders he doesn’t know are reasonable, and he issues no orders that he knows are inherently incompatible with his role as the captain of a powerful vessel entrusted with an inherently dangerous mission. Mount’s Pike exudes casual confidence, projecting the sense to the bridge crew that — not only does he know what he’s doing, but he is holding much in reserve, with a bag of tricks he personally owns (the man is a stellar pilot as well as commander). This confidence envelops the crew, because he expects them to act and implement the honest best of what they can do — the very, very best. Every Pike scene shows that he deserves the command chair not just because he’s the best, but also that he brings out the best in his crew. So, I agree: Pike deserves his own series. Yes. The people making these comments forget that Picard took advice from his staff all the time. They were OK with that because Riker is a white male. Their real problem as that on Discovery the person giving the advice is a WOC. As we move on, the idiotic notions that we can validly judge people according to one’s own prejudices will and must fall by the wayside. I respect the ideals of Star Trek. You know as well as I that the person giving Picard advice was often Guinan (a person of color, and female, well played by the formidable Whoopee Goldberg), and in the movie, “First Contact,” it was Lily, played by Alfre Woodard, a person of color and a woman. Adjudging from the times, how we have regressed! FC was released in 1996, 13 long years ago. When I read strong opinions on Trek boards, I ask whether they are from someone who simply wants to get a rise out of people, engage in flame wars, or attempt to discredit the cause which they are supposedly advancing. Regardless of this, I do think that what you have said makes sense, and this is independent of motive, whether supposed, real, or otherwise. I respect statements that make sense. Trek presented a strong character who happened not to be white or male in FC, and has taken pride in doing so. So, Trek, considered as a social movement, meant something. Does it mean the same thing in 2019? I hope it does. I think it does. Times change. People change. But truths remain. In this age, it is sad that the progress of humanity needs reassurance. And yet, thankfully, by and large, I am reassured. Going to have to disagree with you both again Feminist Trek Fan and Hat Rick. Picard actually frequently actively invited his officers to give their thoughts, concerns and recommendations. And not just in the boardroom style meetings. He would actually say ‘Thoughts Number One’, or throw ‘Recommendations?’ out to the bridge at large. Discovery’s short hand writing style seems to be much the issue here. Pike’s openness to input isn’t verbalized. Basically, we’re supposed to know that he invites it because he let’s it happen. That said, I very tired of only the four leads (Burnham, Tilly, Saru and Stamets) being allowed to have any good ideas. Pike’s extended brain is only 4 people, and they almost never work the problem. It’s not good teamwork actually. Why should his openness to input be verbalized? And by whom? Basil Exposition? Pike has already shown he doesn’t care too much about rank — but he does care about the merit (and the names) of those who surround him. Anyone on the bridge can contribute their input during a crisis. I think we’ve seen that. This makes sense. He respects ideas and is open to them. He listens to Spock, Saru, and even to Tyler/Voq. This is in addition to Burnham, of course. He’s willing to lend an ear to Leland and even Georgiou (the latter of whom he most probably knows is not who she seems). It’s not a town hall meeting. For the most part, it’s a consultation between the captain and his cabinet, so to speak. Kirk listened to Spock, McCoy and few others. The problem is that it appears that many fans don’t get the implied invitation to provide input. They need the exposition. The other problem is that the writers are creating a hierarchy wherein the four star characters always have the ideas and get the last word, with little evidence of going away to refine or work together in a corner with others. TOS had Kirk, Spock, and McCoy. Everyone else were background characters. Don’t forget that one mans crap is another mans treaseure. LOL! It’s a nice insight I guess, but… you know…this is stuff that should’ve been portrayed on the show. We shouldn’t be *told* these things as an afterthought, we should *see* them on the screen as a part of an episode. How come DS9 was so much more successful in portraying the motivation of characters, despite having only loose story arch instead of a tightly serialized one? Damn, even the widely despised Voyager was more proficient in that aspect. Surely it isn’t due to the whole “contemporary TV” thing, because many other contemporary shows are also doing it much better than Discovery does, too. Come on, I wanted to like this show, if only because they told me it’s going to be a Star Trek. I was actually looking forward to having a single starring character because I thought it might bring more personal view of the Star Trek world. What went wrong? I’m not even sure what’s going on here – I originally thought it’s SMG’s fault that Burnham is so wooden, but then I found out she’s actually quite a good actress… elsewhere. So I thought it’s writers’ fault for not giving her enough to play with – but, as is obvious from her words here, she’s being given more than enough, she just doesn’t put it into the show for some reason. So where’s the problem? Is it because of lazy directors? Or is it somehow related with the fact the show’s opening credits list only six actors, but TWENTY ONE “producers”, co-executive or otherwise? If the show spelled out everything thought and motivation of every character each episode would be a three hour exposition dump. The show’s an exposition dump already. Boze I think you are onto something. What we can see is that Discovery has arguably the strongest cast/company ever in Trek. The leads all have strong theatre training. They are used to working in ensembles, and they all say SMG is a good leader of the corps. Secondary actors are all well trained and are able to carry leads on there own, and do so elsewhere. Look how Hannah Cheesman stepped up as Airiam. This strength isn’t consistently making it onto the screen however. No matter how great the company, they have to respect not just the direction from an episode director but more the overall long term direction or concept of their characters. With conflicts, high emotions and exits among the showrunners, it’s no wonder the lead is damping down her performance. She likely has about as clear a sense of her long run arc as Tamara Deverell does when she’s called upon to redesign a set 20 times for a single episode. Whoever the RA is, I hope that their next mission is to erase Tilly from existence. Her one tricky pony act of ‘walk up to soneone/act awkward’ is now beyond dull. I am fed up of the cringing that her appearances bring. Is this what passes for humour now?! She’s also the least realistic character I have ever seen in the ST universe. Starfleet officers are meant to be assigned on merit, but she comes across as someone who’s won a competition to visit a starship, and is a living, breathing liability to any mission. Number One, in her solitary scene came across as a more interesting character than Tilly, and her burger would make a better officer than Tilly. I think you are in the minority here. Eh. I’ve generally fallen into the “more Tilly” camp, but admittedly, they’ve overdone the second half of this season. She needs to be seen to be making progress on the command track. I don’t totally disagree with you. Last season and on the Short Trek, Tilly was a maturing character. Now she’s just a bumbling school girl. I think the character has digressed instead of staying on that upward curve. Too bad. Sully you are alone on this one. I agree with Scott that having her mature, through S1, the Short Trek, and the early parts of S2 was working for me. And that the last few episodes since the change in showrunners has not just been a step back, it has risked turning her into a despised character like Wesley… which is really unfortunate. She was comprehensible as an incredibly intellectually strong cadet on the science track (with lower social skill, mental and physical fitness requirements – even in today’s military there are different fitness requirements for different streams). Seeing her take on the mantle of MU Killy, and seeing other possibilities in herself in command development track was very interesting. Seeing the senior officers Saru, Stamets and Burnham coaching her to work on her ‘too many words’ and physical fitness in order to realize her greater potential on the command was one of the few things that made the ‘lower decks’ concept at all real. Great officers develop great officers, they don’t just arrive from the Academy fully formed. But this reversion to where the show writer’s bible had Tilly at the beginning of season 1, indicates that the new writers don’t know what to do with a prodigy or how officers develop. And we saw how that went with Wesley Crusher…. Yeah, she is quickly becoming a caricature on the show. That needs to change…. I don’t get the burger except that the episode was weirdly filled with food references. I think it was kind of sexist and was purposely placed to negate that she was supposed to be cold. I love all her moments. Tilly is just pure awesomeness. Sorry for people who don’t have the same experience with her; maybe Barclay is more to your liking. But I personally find Tilly to be more naturalistic than he ever was, hands down. One of the themes of this series, I think, is the concept of hidden talents. Cornwell is an admiral, yes, but her talents include psychiatry (as we knew from Season One). Spock is a logician, yes, but his talents include mysticism. Burnham was a Vulcan, but her hidden talents included emotional connections with her foster brother. Stamets is a great scientist and engineer, but his talents include the knowledge of the nature of the mycelial network and how to navigate it. Georgiou (the Mirror Empress) knows treachery, but she, too, is a navigator, of our own universe, where treachery doesn’t necessarily work. Tilly is awkward, but she is very competent. There are people you see whose interactions may seem unbecoming, and yet what we see of them is not all there is. Great leaders are made as much as they are born, and sometimes those who are the least promising are those who will prove themselves when the occasion comes when they must rise to the top. Their journey toward greatness is what enthralls. Sometimes — most times — “Alexander” is not the name of a great general of antiquity, but a little person who has found his role (“Plato’s Stepchildren,” TOS). Both are equally great in their own way. Tilly’s journey has only just begun. Uhm, what some of us are trying to say is that that there was progress and development in Tilly. And reverting to S1 E3 Tilly is making her a satire of herself. Let’s get the new writing team on board with this or an interesting opportunity to let a character develop risks a Wesley Crusher type fan backlash. Which would be no more fair to the Tilly character or the actor than it was to the concept of Wesley or to Wil Wheaton. Tilly is being Tilly…trying to undo her personality or shun her because it annoys one’s sensibility and tolerance is remarkably similar to what happens in real life, unfortunately. She will find her own footing in the command structure, with time, diligence, and support. She doesn’t need the approval of hecklers and bullies proclaiming some ambiguous superiority; she has her family and friends to stand beside her. I agree. You know, the more I think about the Airiam character and how — in a single episode (plus a few small scenes) — her death impressed upon us the injustice of fate, the more I’m rooting for the characters we see too little of in DISC, including to a fair extent Tilly. (Also, where is the goshdurned ship’s engineer?) Tilly was obviously one of Airiam’s closest friends in Starfleet; Tilly, Detmer, Burnham — these were some of the people that Airiam knew and who remember her well. Their memories are all there are of Airiam now, as far as we know. Her importance benefits from this in a story-narrative sense. Airiam was alone in the universe as well, a very rare or perhaps unique cybernetic person who succeeded despite the loss of much of who she was. Tilly is who she is. In a relatable way, Tilly saw in Airiam a bit of the loneliess that came from being an outcast in societal terms. But Airiam is gone. Tilly is still here. The insecurity that is thrust upon someone who was already ostracized is magnified when one of her close friends is dead and erased. Most people would be a nervous wreck. Tilly did her job in finding the neural signature, putting aside her emotions and her relationship with her deceased friend. So she burst into the meeting with Cornwell, Pike, Burnham, et al. So she wasn’t at her best at that time. So she said some rather sophomoric things about doors that slide open by themselves. But the important thing is that she did her job. Forgive her her trespasses, I say. I could accept backsliding in Tilly’s comportment Hat Rick for the rationale you outline. Let’s just hope the new writing group takes her forward rather than back. Quite nice of you to say, and agreed. 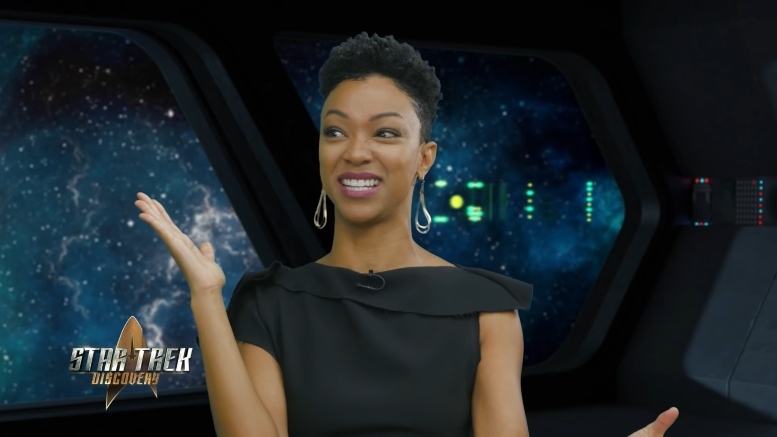 Michael Burnham is not so bad. Tilly will mature over time. The Red Angel is the best thing about this show this far. We like Tilly the way she is now. Never Change Tilly ! war. Season 2 is such a hodgepodge of themes and elements it is hard to follow. This is mainly the fault of the writers. The actors are doing their best. The Red Angel plot is dumb. I wish these shows would think small. How many times can one save the universe?